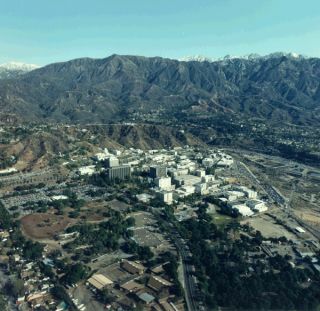 Aerial view of NASA's Jet Propulsion Laboratory (JPL) in Pasadena, Calif.
WASHINGTON — NASA's Jet Propulsion Laboratory — which is run by California Institute of Technology employees, not federal civil servants — has temporarily dodged the government-shutdown bullet, ensuring that several major robotic space missions — at least for the immediate future — continue regular operations as other NASA centers shut their doors to all but a small number of "essential" personnel. "Because all of our employees are here and working, all of our day-to-day missions that were planned will continue," Veronica McGregor, a spokeswoman for JPL, told SpaceNews Oct. 1. "All of NASA's existing missions are expected to continue space operations." While all but 549 of NASA's roughly 18,000 civil servants have been furloughed, some contractors will be able to continue their work for the space agency, NASA spokesman Allard Beutel said Sept. 30. "Contractors that have sufficient funds on contract and have a facility outside NASA can keep working," Beutel told SpaceNews. "If they're doing any work on a federal facility, that has to stop." JPL, unlike other NASA centers, is a federally funded research-and-development center run by Caltech under contract to NASA. That means data gathered by JPL-led missions can still be parsed by scientists and engineers at the Pasadena, Calif., field center. For missions run by other centers, skeleton crews will operate spacecraft to ensure that data keeps flowing, but prohibit anyone from studying it in detail until the shutdown is resolved. "Operating satellites get to maintain operations, but no scientists and engineers can process that data," Beutel said. "The ones and zeroes come in and that's all. Curiosity, the headline-grabbing Mars rover that landed on the red planet in August 2012 to search for signs that the planet was once habitable. The Widefield Infrared Survey Explorer, which was recently reactivated to look for near-Earth asteroids, including candidates for the Asteroid Retrieval Mission NASA splanning. Voyager 1 and Voyager 2, probes launched in the 1970s on a journey beyond our solar system. Voyager 1 reached interstellar space back in 2012, NASA announced Sept. 12. The Gravity Recovery and Climate Experiment, twin Earth-observing satellites that launched in 2002 to examine our planet's gravitational field. Even JPL's website, unlike nasa.gov, was still open to the public, as of Oct. 2. However, McGregor said there would be no updates to the website, and that JPL-run social media would go silent until the government shutdown ends.